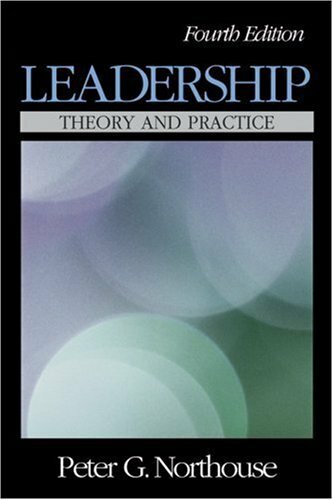 Leadership: Theory and Practice provides a description and analysis of a wide variety of different theoretical approaches to leadership, giving special attention to how each theory can be employed to improve leadership in real-world organizations. Written in a clear, concise manner, the first edition has been widely used in undergraduate and graduate courses in business, organizational communication, political science, public administration, training and development, and health services. The newly expanded second edition includes more leadership topics, research findings, questionnaires, case studies, and everyday applications. Now in it's fourth edition, this book is written to attempt to bridge the gap between the simplistic popular literature and the more abstract theoretical approaches. It does this with a layout approach I have not seen before. It uses two color printing throughout and usually the theory about a situation is printed on the white pages and then a case study is printed with a blue background. The case study directly relates to the problems addressed by the theory. There are no answers to the case studies as in real life there are often no answers. This gives the instructor ample room to open discussions and provide guidance. Culture and Leadership - examines the latest research on culture, its dimensions, and ways in which culture affects the leadership process. Women and Leadership - examines the styles of female and male leaders and their effectiveness, the causes of the glass ceiling and how it is being broken. I first used Northouse's book in 2001, when I was a doctoral student. The book truly provides a good overview of the most common leadership theories and styles that exist, along with their advantages and disadvantages. I recently used the book in another position: as an instructor of leadership courses. My current perspective is that some chapters are better written than others, but that may have to do with the fact that not all chapters are written by the same author. Yet, overall, it is a very useful work for those who want to familiarize themselves with the predominant perspectives on leadership. Although I used this book as a partial foundation for my own work, "The Awakened Leader: One Simple Leadership Style That Works Every Time, Everywhere," there is one major difference: While Northouse basically presents various leadership theories alongside each other as separate, non-complying entities, "The Awakened Leader" claims that leadership in the new millennium should entail segments of ALL leadership styles and theories on an appropriateness basis. I firmly believe that, in a time where globalization has become a part of our everyday life and has ignited increasing interdependency, multiplicity of mindsets and approaches, and multi-faceted workplaces, there can no longer be a separation of various leadership styles. Consequently, "The Awakened Leader" presents a meta-leadership approach, which guides the leader toward implementing the appropriate leadership style once he or she has assessed the situation, the followers, and the environment at hand. Awakened Leadership is based on flexibility through open-mindedness, or wakefulness. And it completes the perspectives that many great leadership authors have presented us in the past decade: successful leadership of the self and others, based on proven trends of the past, the now, and the future. Much stronger on Theory than actual Practice. Northouse writes engagingly and clearly and presents an excellent primer on managerial leadership. The book covers all the main elements needed to gain an understanding of the topic as well as the general progress of leadership theories and their application in a managerial context. Each Chapter is dedicated to an approach starting with the Trait Approach in chapter 2 (after an introduction to leadership in chapter 1) and culminating with Contingency theory. All the chapters are organized in a consistent and logical manner starting with (1) a description of the theory; (2) how does it work; (3) its strengths; (4) weaknesses; (5) applications and then some (6) case studies. This makes Northouse's treatment very straightforward and combined with his writing style, both an enjoyable and educational read. We are using this in my Intro to Leadership course at college and I have found the book to be very interesting. The author writes very clearly and explains everything quite well. I know its weird to write about, but I really enjoy this authors writing style. I rarely get an academic book where the writing is simple and very straight forward. In a crunch, I can read the first setence or two from each of his paragraphs and understand the concepts of the chapter quite well. As far as leadership practice vs. theory, I am still learning about leadership so I can't say much in this regard. I believe the book has taught me more about leadership than I will ever learn actually being placed in a leadership position. I would definetely suggest reading this book, thinking about your own personal experiences while you read, and then think of ways you can apply things in real life to give your self an idea about leadership practice. If you're interested in a scientific approach to the various styles and theories of sound leadership, then this is for you. I highly recommend this read for anyone in a leadership role. A must read for Senior Managers of organizations who arrived in their positions with little knowledge of what it means to lead...that's alot of you folks! !